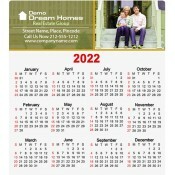 Custom Home calendar magnets 2018 are perfect for real estate marketers specializing buying, selling and restoration of homes. These personalized magnets lend them large print area for positioning their contact information, logo, business visuals and calendars. Offered in various sizes and free full color printing, real estate marketers can easily find the one which fits into their budget and allows them to exhibit their creativity. 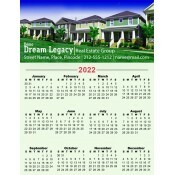 We offer great savings on wholesale orders of these promotional real estate magnets. 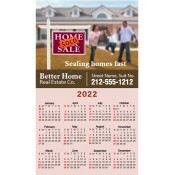 Promotional home calendar refrigerator magnets make a great giveaway for real estate businesses which are attempting at long term stay in the homes of their current clients or prospective clients. Full color promotional magnets are slowly becoming a staple in many US homes because they serve as a refrigerator magnet and reference token. People love magnetic calendars because they help them to track dates, organize schedules, and manage their daily routine. Over the years, real estate marketers have been heavily investing in various print, media, and online advertisements for marketing their business. They have been splurging on vast multi million budget advertisements to make their mark. However, real estate marketers are now taking it to personalized advertising. They understand that it is important to strike rapport with their customers or clients on an individual level to keep their business going. It is seen that people are largely turning to reviews from friends to affirming their belief in a particular realtor. These promotional magnets will aid people to refer particular real estate services to their friends or colleagues whenever they require such services. We offer great discounts on wholesale orders of these real estate magnets which make it easier for realtors to consider it as giveaways during tradeshows, business conventions or other events. In addition to that, we offer free art setup, free online design proof and free shipping on all our promotional magnets which helps realtors to further their savings without compromising the quality. Realtors can send away these promotional magnets as bulk mailers because their clients will love a purposeful promotional gift. Small time real estate businesses which are offering home repair or other related services can also easily avail these promotional magnets. To know more about printing, customization, savings and other details feel free to contact us at 855-762-4638 or write to us at info@cmagnets.com.